After hovering for years in political limbo, the long-proposed Keystone XL pipeline, intended to move heavy Canadian crude oil through America’s heartland to the Gulf of Mexico and ultimately out into the world market, was brought to ground today by President Obama. After noting that Secretary of State John Kerry had completed the State Department review of the proposal and determined that the pipeline “would not serve the national interest of the United States,” President Obama simply said, “I agree with that decision,” bringing years of political drama to an end. Reacting to the White House call on Keystone, Dan Misleh, executive director of the Catholic Climate Covenant, said, "President Obama's decision...is another sign of the growing awareness that business as usual with regards to fossil fuels is not sustainable. "As Pope Francis said in 'Laudato Si,’' we need to begin to envision a new future for our children and to begin to reduce our use of fossil fuels." Misleh added, "It seems to me that we have to accompany this big and symbolic 'no' with an affirmative and actual 'yes' on what we can do to not only reduce our dependence on fossil fuels, but to invest in and deploy cleaner, more sustainable energy technology and sources. Misleh said that the Catholic community, with its size and resources, "ought to quickly become a leader in this new, exciting and sustainable future," adding "it is what is required of us to show our love of the Creator through love of creation." “And all of this obscured the fact that this pipeline would neither be a silver bullet for the economy, as was promised by some, nor the express lane to climate disaster proclaimed by others,” he said. 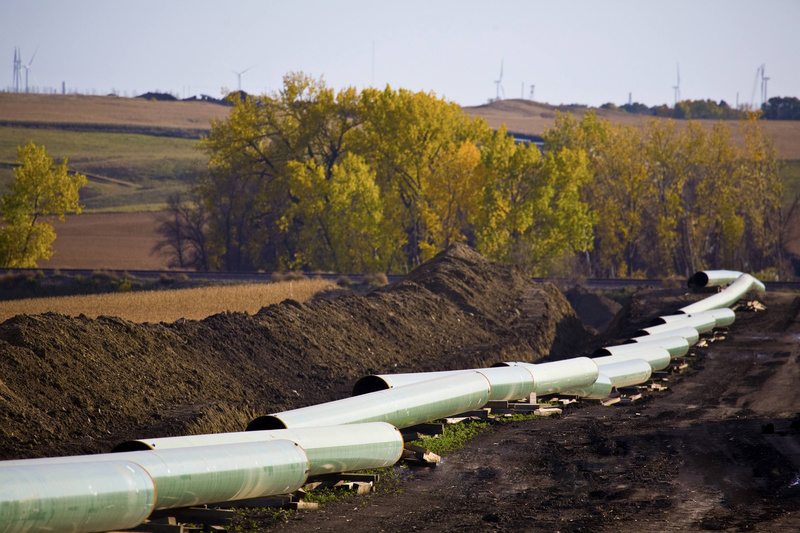 Patrick Carolan, Executive Director of the Franciscan Action Network, described himself and the members of the network as “elated” by the apparent end of the proposed pipeline. He said the decision was long overdue. “This sends a real strong signal going forward to Paris about [the U.S.] commitment to bring about serious action on climate change.” Carolan was referring to the upcoming U.N. sponsored conference aimed at hashing out national commitments to respond to the various threats of global warming which begins at the end of November. The project has always been the target of environmentalists concerned about the devastation caused by extraction of oil from Canadian tar sands and the high energy consumption of that process. Many also feared the impact on climate change of the processing and burning of this low-grade oil Canadian oil. Proponents have long argued the pipeline would be a job producer and mean lower gas prices and oil independence for North Americans. They argued that the pipeline, despite the possibility of an accident or act of terror leading to a rupture, was the safest and most reliable means of bringing oil to market. Several devastating train-wrecks of tankers loaded with oil being transported out of Canada and North Dakota seemed to buttress that argument. But many political and civic challenges remained before Keystone, acquiring miles of private land to thread the pipeline through not least among them. In recent years the economics of the entire plan has fallen into question as oil prices continued a historic plummet. With gas prices half as much as just a few years ago, many began to wonder if building Keystone would prove an industrial miscalculation of historic proportions. Keystone’s developers asked on Nov. 2 for a “pause” in the State Department review—officially citing ongoing efforts to get its route in Nebraska approved by the state's Public Service Commission but perhaps with an eye toward reintroducing the plan during a more favorable political and economic environment in the future. On Nov. 4, the State Department rejected that request before issuing its recommendation to President Obama on Nov. 6 to turn down the plan. F.A.N. 's Carolan said that the president’s decision reflects the culmination of six years of grassroots mobilization and coalition building, “groups that would never think could work together coming together” to resist the pipeline. Remembering scores of demonstrations and hundreds of arrests, he said, “It’s been a long battle." In his statement the president set the nation’s course on a clean energy future, suggesting that the burning of fossil fuels as a bridge to that sustainable future. He added, “The truth is, the United States will continue to rely on oil and gas as we transition—as we must transition—to a clean energy economy. That transition will take some time. But it’s also going more quickly than many anticipated. “The old rules said we couldn’t promote economic growth and protect our environment at the same time,” President Obama said. “The old rules said we couldn’t transition to clean energy without squeezing businesses and consumers. But this is America, and we have come up with new ways and new technologies to break down the old rules, so that today, homegrown American energy is booming, energy prices are falling, and over the past decade, even as our economy has continued to grow, America has cut our total carbon pollution more than any other country on Earth.” That is a leadership position which has become an example to the world, according to the president, and one he is unwilling to relinquish to move another country’s oil to market.